Gardening Workshops are a Success! The first three gardening workshops of the year got Mendocino residents out gardening! We kicked off the workshops on Earth Day, April 22nd, with a cob building party at the Talmage Preschool Garden at MCOE. Cob is a natural building material made of clay, sand and straw and we used it to build counters around an already existing outdoor oven. The preschool will use this outdoor kitchen to bake bread and chop up veggies and fruits from the garden for snacks. After the cob party, Ron Woolsey, of Living Sculpture Studios, led a "Planning a Summer Garden Workshop" at the preschool garden. For more information about Ron's workshop, check out this article from the Ukiah Daily Journal! Ron will be teaching more gardening workshops soon: "Weeds, Mulch & Compost" in June and "Hoop Houses & Row Covers" in October, so keep your eyes open for details coming soon on those workshops! This was followed by a "Seed Starting Workshop" by Nona Carpenter and Louisa Aronow, of the Master Gardeners at the Grace Lutheran Church Community Garden. Louisa will be teaching a "Planning a Fall Garden" workshop in July, so look for details on that as well. 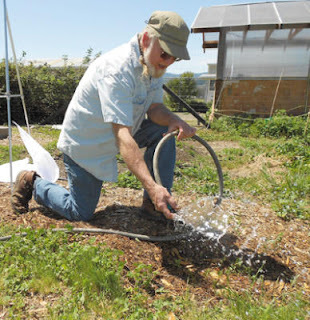 On 5 de Mayo, Peter Reynolds, of Down to Earth Landscaping and a Plowshares garden volunteer, taught a Drip Irrigation workshops at the Plowshares Garden. The Plowshares garden provides fresh vegetables for the Plowshares Peace & Justice Center kitchen, which serves several hundred people a day. Peter installed the fantastic drip irrigation system for this garden, and demonstrated how to install a system like that at the workshop. All of these workshops were a great success and we look forward to the next 10 workshops of the year! Details coming soon.